Japanese emergency teams say they are ‘not afraid to die’ as they face dangerous levels of radiation in the fight to stop catastrophe at the tsunami-hit Fukushima nuclear plant. The stricken power station was abandoned for hours today, as soaring radiation forced the emergency workers to flee for their lives and authorities were reduced to spraying reactors with police water cannons. But 180 workers this afternoon bravely headed back towards the plant to pump water on to the over-heating reactors. Some experts speculated that they were on a ‘suicide mission’. The group of 180 employees rotate shifts working at the plant in teams of 50 men. The men – nicknamed the ‘Fukushima Fifty’ – had this morning been pulled back 500 yards from the complex as radiation levels became too dangerous. However the technicians later headed back in to the reactors for difficult and dangerous work, wearing radiation suits and gas masks or oxygen tanks that provide little protection from the invisible radiation rays bombarding their bodies. It came after the French government launched an extraordinary attack accusing the Japanese of losing control of the situation and hiding the full scale of the disaster. Military helicopters also made a failed attempt to drop water on the reactors from above and police water cannons, usually used in riot control, were even requested to spray the site amid desperate efforts to cool nuclear fuel. The helicopter missions are said to have failed because radiation levels put the crews in danger. The emergency teams have been pumping sea water into reactors using fire engines, but those efforts are thought to have stopped as the workers were pulled out. A source in contact with emergency teams told CBS they were ‘not afraid to die’ as they fight to stop a meltdown amid the dangerous levels of radiation. A succession of experts has also warned that the situation is rapidly deteriorating and raised fears for the lives of the emergency teams. ‘We’re very close now to the point of no return,’ Dr. Michio Kaku, a theoretical physicist, said. ‘It’s gotten worse. We’re talking about workers coming into the reactor perhaps as a suicide mission and we may have to abandon ship,’ he told ABC. Those fears are stoking a mass exodus from the country, with wealthy foreign experts engaged in a scramble to book private jets. Terrified passengers also crammed into Tokyo’s Narita international airport, 150 miles from the stricken plant, in a desperate bid to escape the country. Lufthansa and KLM today became the first airlines to cacnel flights to Tokyo. In a sign of mounting panic, Cabinet Secretary Chief Cabinet Secretary Yukio Edano has already warned that the cooling efforts may not work. Nuclear experts said the solutions being proposed to quell radiation leaks at the complex were last-ditch efforts to stem what could well be remembered as one of the world’s worst industrial disasters. The biggest concerns centre around the four over-heating reactors, and in particular radioactive steam pouring out of the plutonium-fuelled reactor number three which exploded on Monday. Plutonium is far more hazardous to health than uranium, which is used to power the other five reactors on the site. 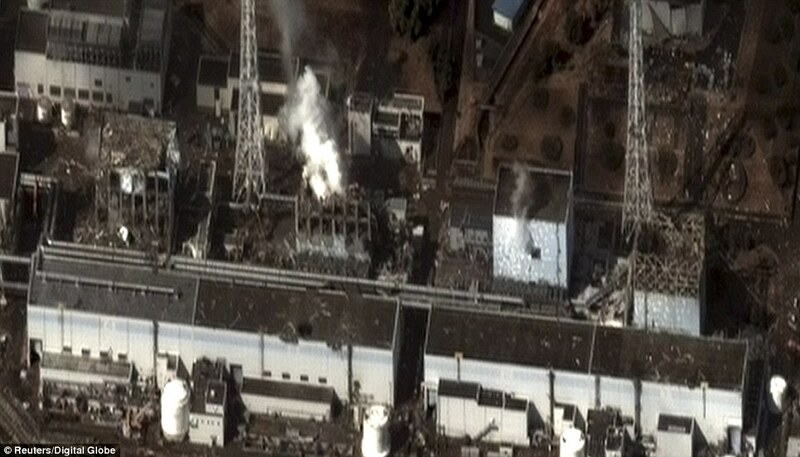 There has been damage to four reactors at the Fukushima , three of which were hit by explosions and another caught fire. Reactor number four is the second highest concern after a nuclear fuel storage pond was exposed to the atmosphere after a fire. A fifth and six reactor, which were previously unharmed, were today being sprayed with water amid reports that they too were heating up. More than 140,000 residents within 19 miles of the plant have been ordered to stay indoors – in addition to the 180,000 already evacuated from the immediate area. Terrified families clogged roads as they tried to flee. And The French government urged its nationals living in Tokyo to leave the country or head to southern Japan due to the risk of radiation from an earthquake-crippled nuclear power plant to the north of the capital. The French embassy in Tokyo said in a statement that its advisory applied with immediate effect to those French nationals who were not obliged to remain in the city. It added that it had asked Air France to mobilise planes currently in Asia to evacuate French citizens, and two were already on their way. On Tuesday, a fire broke out in the reactor four’s fuel storage pond – an area where used nuclear fuel is kept cool – causing radioactivity to be released into the atmosphere. TEPCO said a new blaze erupted last night because the initial fire had not been fully extinguished. The turn of events caused European energy commissioner Guenther Oettinger to warn that Tokyo had almost lost control of events. ‘There is talk of an apocalypse and I think the word is particularly well chosen,’ he told the European Parliament. But just before 4am this morning the Japanese government said that the fire which had raged for around seven hours had been brought under control. The Japanese government later ordered emergency workers to withdraw from its stricken nuclear power complex today amid a surge in radiation. Chief Cabinet Secretary Yukio Edano said the workers, who have been dousing the reactors at the Fukushima Dai-ichi plant with seawater in a frantic effort to stabilise their temperatures, had no choice but to pull back from the most dangerous areas. The alarm spread worldwide. In Europe, some 500 bone marrow transplant centres were put on standby to treat any victims from Japan. And in India, officials demanded that imported Japanese goods be screened for radiation contamination. The plant was yesterday rocked by a fire and two more explosions . One damaged the concrete and steel walls protecting reactor 2 – as concerns grew that the casing could split and potentially send out a cloud of dangerous radiation. Aftershocks continue to hit the country, and a 6.0 magnitude tremor struck in the Pacific just off Chiba prefecture, east of Tokyo, today, raising concerns that further damage would be caused to the already-weakened container walls of four reactors at the Fukushima plant. Hajimi Motujuku, a spokesman for Tokyo Electric Power (TEPCO), said the outer housing of the containment vessel at the No 4 unit at the complex caught fire. In desperation, Tokyo Electric Power, which is responsible for the Fukushima plant, asked U.S. helicopters to drop water on to the building in an attempt to cool a reactor, as radiation levels are too high for people to approach it. Levels at the site peaked at a dangerous 400 millisieverts yesterday – four times the level that can trigger cancer. However, they had fallen again by the end of the day. Japan ordered a 30-mile no fly zone over the exclusion zone to stop the spread of radiation. Despite this, officials stressed that radiation levels were safe and called for calm. Panic spread to Tokyo, where radiation has risen to ten times the normal level. Shoppers stripped food and face-masks from shops and filled outbound trains. Potassium iodide pills, which deal with the consequences of radiation, were changing hands for £300, instead of a few pounds. The U.S. took new steps to protect its personnel from radiation by moving warships to safer waters. At the Yokoshuka Naval Base, 200 miles south of the plant, it told personnel and families to limit time outdoors and to close off ventilation systems ‘as much as practical’. At least 17 Americans on helicopter missions have been exposed to the equivalent of around a month’s worth of background radiation. To make matters worse, a fresh earthquake hit Japan, registering 6.2 on the Richter Scale – and the death toll rose above 3,300, although it will inevitably climb further. The sense of crisis at the nuclear plant has been growing since Friday’s tsunami, caused by a massive earthquake, knocked out the cooling systems essential to prevent the plant’s uranium and plutonium fuel rods from overheating and melting. Meanwhile, France’s Nuclear Safety Authority said the disaster now equated to a six on the seven-point international scale for nuclear accidents, ranking the crisis second only in gravity to Chernobyl in 1986. Three of the plant’s six nuclear reactors were working when the disaster struck. Then, on Saturday and Monday morning, fireballs rocked the site when hydrogen gas – released deliberately to ease pressure inside reactors 1 and 3 – ignited. On Monday night, a third hydrogen explosion hit reactor 2 and in the early hours of yesterday morning reactor 4 was rocked by an explosion damaging the roof. The blast at 2 demolished the building housing the reactor and damaged the 80-inch steel and concrete containment unit that protects the radioactive core. Damage to the reactor’s core, combined with a breach of the containment unit could be catastrophic. Japan’s nuclear safety agency said the blast may have hit the unit’s suppression chamber – a large doughnut shaped structure below the core. A crack would have allowed radioactive steam and particles to escape. Firms began evacuating staff from Tokyo. German companies such as BMW and Bosch said they would take foreign staff out of the country. Several German banks were doing the same. Austria said it would move its embassy out of the capital hundreds of miles to the south, to the city of Osaka. Meanwhile, German airline Lufthansa said its daily flights to Tokyo would instead fly to Osaka and Nagoya. Air China cancelled all flights to Tokyo from Beijing and Shanghai. India announced it would test imported products from Japan for radiation. Ports and airports were told to check food for signs of contamination. Katrina, BP, Tsunamis, Earthquakes… Now, we have nuclear devastation. Still, the debate continues as to how we are going to get oil and continue with nuclear energy. I think the Earth has spoken loud and clear. If we are not listening, we shouldn’t be surprised at the outcome. Maybe the Mayans were right. P.S. France is one of those countries that follows a nuclear energy course (like Japan).